Japan Centre 35th Anniversary Promotions at Regent Street! 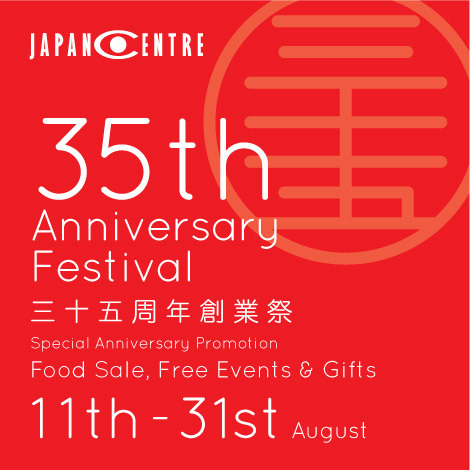 Special Anniversary Festival Promotion: 35 Years of Japan Centre in London! 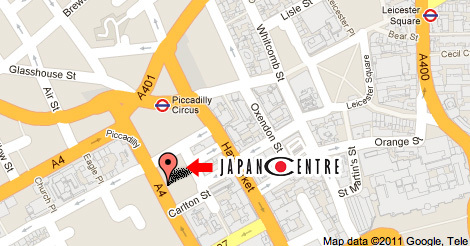 Can you believe 35 years have passed since Japan Centre first began selling Japanese items in London! It wasn’t Japanese food back then either, but a selection of books and martial arts equipment. We have since grown to become one of the largest and most influential Japanese shops in London, offering a great range of services and products for anyone interested in Japanese food and culture. 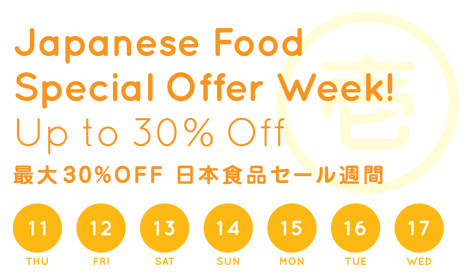 To celebrate our 35th Anniversary Festival, the Japan Centre food shop in Regent Street have amazing new promotions every week for the next three weeks, with great discounts on your favourite Japanese foods, free gifts and food tasting and even a huge sale at our bakery! Read on to find out what great events we have on for the next three weeks! 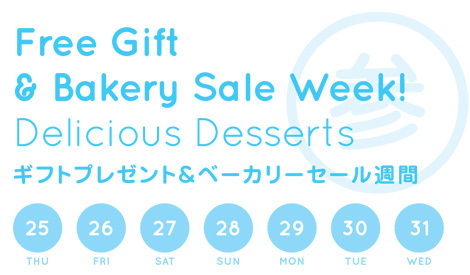 This week we have a great sale at Japan Centre Regent Street on a huge range of popular Japanese food items such as Pocky, noodles, salad dressings and Japanese sushi rice. Our second week of promotions is a mini Japanese festival with free tasting events for a huge selection of delicious Japanese food and demonstrations so you can learn to make these dishes yourself. We also have a free raffle where everyone who spends over £20 at the shop has a chance to win a food prize. Raffle – Win some great food items! 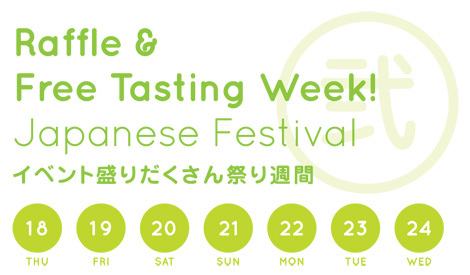 Every customer who spends £20 or more at Japan Centre this week will be able to play an authentic Japanese raffle to win a guaranteed free food prize such as sake, soy sauce or noodles etc. Did you know that Japan Centre has one of the largest selections of traditional Japanese sake in London? You can come and sample some of the delights of Japanese sake rice wine for free this whole week. Matcha is one of the healthiest and most popular types of Japanese tea. Try a free sample and then learn how to make a delicious hot or cold matcha latte using freshly ground matcha green tea powder from Japan Centre. Yakisoba is a classic festival food that you can find all over Japan in the summer. Made with tasty noodles and plenty of yakisoba sauce, learn how to make this tasty dish and try a free sample at Japan Centre. From sencha to matcha, gyokuro to hojicha, there are so many different varieties of Japanese green tea, all of them with unique tastes and aromas! Learn how to expertly prepare authentic green tea with the right techniques. Free Original Eco Friendly Bag! Spend over £20 at Japan Centre Regent Street and get a free eco bag with an original Japanese style design. These bags are a great way to help save the environment with a reusable shopping bag… and look cool while doing so! Melon pan is a seriously tasty Japanese sweet bread that is made with soft, fluffy bread on the inside with a sweet, crispy coating on the outside. The name melon bread comes from the texture of the bread, rather than actually being flavoured with melon! Homemade Ice Cream 25% Off! We now make our own ice cream at Japan Centre in a variety of delicious flavours. Try the great taste of mango, strawberry, coconut, lychee or of course, the amazing Japanese green tea flavour for a truly authentic Japanese dessert! Dorayaki are Japanese style pancakes with a tasty filling inside. Besides the traditional azuki sweet red bean filling, we also have dorayaki filled with custard, lemon custard, chocolate and healthy green tea flavour! No matter what your favourite Japanese foods are, we are sure that we will have something for you at our 35th Anniversary Promotion. Head on down to Japan Centre in Regent Street from the 11th to 31st August and enjoy some free food, drink and learn more about cooking Japanese cuisine. Don’t worry, we haven’t forgotten about our favourite Japan Centre fans, all you guys who helped to make Japan Centre Online what it is now! We will be offering a selection of separate sale items and gifts for people who buy online during our 35th Anniversary Festival Promotion. Make sure that you don’t miss out on these online anniversary offers by becoming a fan of Japan Centre on facebook and getting all the latest news! Posted in Food, Stores and tagged Free Gifts, in-store tastings. Bookmark the permalink. COMPETITION: Win a Pair of Tickets to See “Halcyon Days” Japanese Theater Performance! COMPETITION: Win Tickets for ‘Villain’ – The “Best Japanese Film of 2010”!